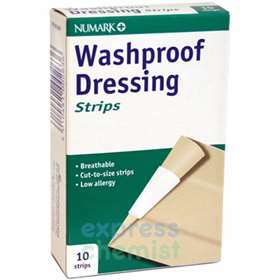 Numark washproof dressing strips are ideal for protecting wounds in wet conditions. The washproof backing is micro-perforated enabling air to penetrate the wound, aiding the healing process. Contains 10 strips measuring 10cm x 6cm.